'We just need the manager to get out of the way,' one anonymous Phillies player reportedly said. Phillies manager Gabe Kapler talks with catcher Andrew Knapp and first baseman Carlos Santana during one of his many pitching changes. 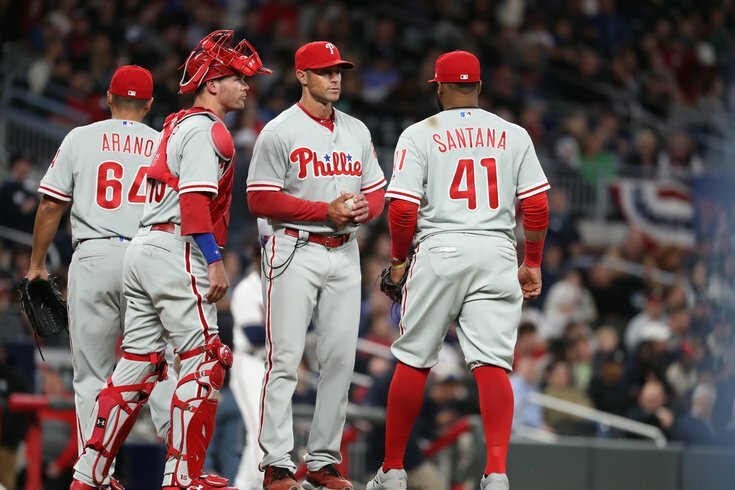 Just last week, following an absolutely terrible loss on Opening Day, we published a story suggesting that the Phillies could be playoff contenders – if new manager Gabe Kapler doesn’t get in the way. While that's harsh criticism for a guy managing his first big league game ever, it was hardly the only story critical of Kapler's ill-fated decision to lift Aaron Nola in the fifth inning of a game the Phillies were winning 5-0 after he'd thrown just 68 pitches. In the four games since, things haven't gotten much better for the Phillies, who host the Marlins in their home opener on Thursday. Now, after several more managerial mistakes – including one that had all of baseball laughing at Kapler – and a few more losses, it seems fans and reporters aren't the only ones questioning Kapler's style. The Philly reporters, as tough as their town, have been chronicling this difficult beginning, blow by blow, from the one obvious mistake to summon a young pitcher into the game who hadn’t thrown even one warmup pitch to questions about how the young team is reacting to the newbie manager. They don’t let anything go, but they are all legit questions, and the answers are conjuring more questions. The Phillies’ 1-4 start isn’t determinative, of course, as 97 percent of the season is yet to be played. But there are signs that some – even team members — are having their early doubts. While Kapler has taken the blame for his errors – at least the ones he considers to be errors, which doesn't include the decision to remove Nola – the 42-year-old doesn't necessarily seem apologetic. And he certainly doesn't seem like he's going to change his ways, instead hoping that Phillies fans come around to his way of thinking. "I’m a fighter, and I think the fans in Philadelphia are fighters, too," Kapler told FanRag Sports. "If the fans are upset with me, that’s OK. It’s going to get better. In the end, Philly fans are going to respond to me. I’m a battler, like they are. Early on, it hasn’t been easy. But I don’t want or expect it to be easy. Because that’s going to make it that much sweeter when we have success." That's great, assuming the success actually arrives before it's too late. Otherwise, Kapler could find himself getting run out of town faster than Chip Kelly, the last smarter-than-you coach who tried selling unorthodox ideas to a fanbase that has been historically adverse to the new and different. Losing may be the only thing Philly hates more. And if you combine the two, well, it could get ugly. In the meantime, anyone who has ever doubted Kapler's "Be Bold" mentality and outside-the-box way of running a team is taking this opportunity to get their shots in, according to Heyman. There's still A LOT of baseball left to play this season, and the Phillies could certainly turn things around. But, in addition to the young manager's struggles, his even younger team is having some growing pains of its own. That's not an opinion. The numbers – you know, the thing Kapler bases all of his decisions on – prove that to be fact, even if it's an incredibly small sample size. Heading into their series against the Marlins, the Phillies had the worst batting average (.183) and are scoring the second-fewest runs per game (2.8) in the National League. And their pitching staff is allowing an MLB-high 6.6 runs per game. LA -"The Phillies are last in pitching...and hitting"
Franzke -"That about covers it"
Yeah, you're not going to win a ton of games that way, no matter who your manager is or how much he's getting in your way. The Phillies may have won their home opener, 5-0, but this is, uh, not great.